22. Sample database "BackStage View 1" (Zip Archiv 28 KB). This database contains all XML files from section "BackStage View" in table "USysRibbons". Click with the right mouse button on the "Navigation Pane" title and in the context menu on "Navigation options ...". You can reach the navigation options also by "Office Button" / under Place "Help" - Button "Options" / "Current Database" / "Navigation" / Button "Navigation Options...". "Office Button" / under Place "Help" - Button "Options" / "Current Database" / "Ribbon and Toolbar Options" / "Ribbon Name:" select the ribbon that should be loaded when starting the database. 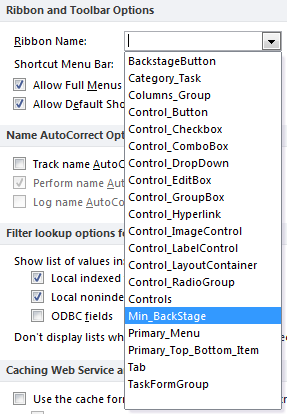 After a database re-start the selected Backstage will be loaded and displayed in the Backstage View area.